A stylish and fun piece of direct mail helps to make Businessmagnet stand out from the crowd. Businessmagnet.co.uk is the UK’s leading business-to-business directory, and at the end of August they approached us looking for some exciting ideas for their welcome pack mailer aimed at new subscribers. The purpose of the mailer is to promote the range of value added services available from Businessmagnet, and to encourage customers to engage with their dedicated Businessmagnet account manager. We got together with the guys at their offices to discuss the format of the mailer and its content. They were keen to give away a magnetic toy that would sit on their customers’ desks as a constant reminder of Businessmaget, so the welcome mailer would need to accommodate the chosen item. We narrowed down the key messages of the mailer to a simple series of steps leading up to the final call to action – contacting their account manager to upgrade their Businesmagnet listing – and got to work on the design. The finished mailer shows how a clear goal and careful copy writing can pay dividends in the success of a direct mail piece – the whole design is geared towards guiding the customer towards contact with Businessmagnet. 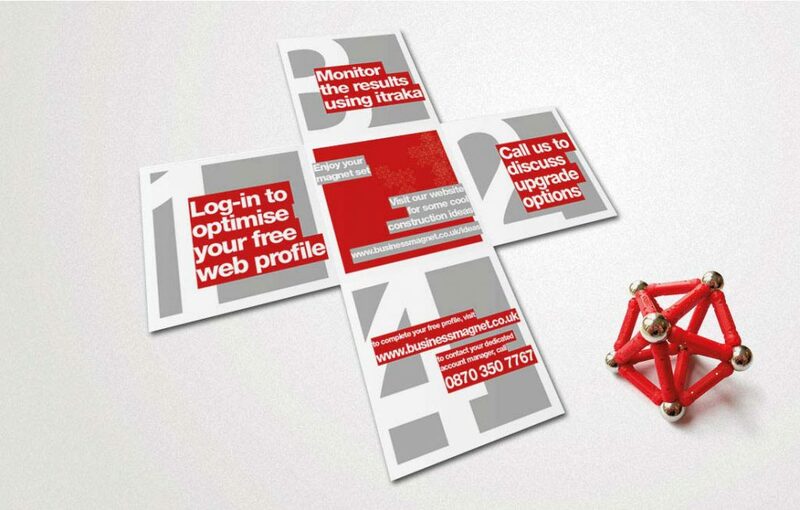 Add in strong typography, a reduced colour palette (red and metallic silver) and a playful use of the magnetic toy in the design and the result is a mailer with real personality. So much so that we were also asked to apply the same brand style to their rate card/brochure.